Responsible dog owners train their dogs properly to prevent dog bites, but you can’t always depend on the responsible behavior of a dog owner when you’re approached by or are approaching a dog. Even dogs you are familiar with can unexpectedly bite if they are startled, don’t feel well or aren’t in the mood to interact. 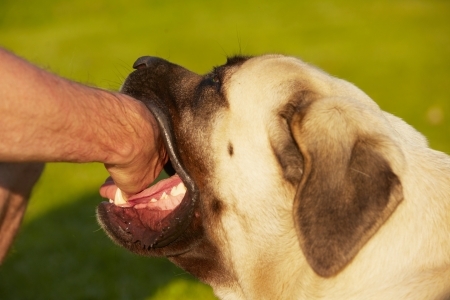 To protect yourself from dog bites, it’s imperative to know how to interact with dogs properly and when to back away. Heeding a dog’s master when they warn you that the dog doesn’t like strangers or is skittish is the best way to avoid a dog bite. Likewise, you should never approach an animal who is in a car or confined space without an owner nearby. Their instinct will be to defend their ground. Leaning over a fence is also a bad idea. It is important that you do not turn your back on or run away from an aggressive dog. The dog’s predatory instinct will kick in and he may chase you. If you think a dog is going to attack you, stand still and avoid eye contact, which he could see as a challenge. Try not to scream or shout and keep your hands at your sides. Once the animal loses interest, you can slowly back away. If he doesn’t lose interest and does attack, let him have your coat, purse, backpack or anything else that he can bite instead of you. If you are knocked down or fall, curl up and remain motionless, putting your hands over your ears so that he can’t easily grab any part of your body. Stay in this position until he loses interest or someone comes to your aid. 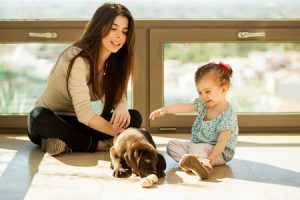 Teaching your children how to properly interact with pets can prevent dog bites. Never attempt to befriend a strange dog or pet a familiar one without the owner’s permission. Before touching a dog, let him sniff your hand. Never pull on a dog’s ears, tail or touch their face. Don’t pet any dog on the top of the head; instead, pat his shoulders or back. Never try to pet or play with a dog who is eating, chewing on a toy or sleeping. Never approach a nursing dog; she may perceive you as a threat to her pups. Never touch a dog that is scared, barking or growling. Always report a dog that is loose in your neighborhood. When a dog leaves the room, do not follow him. Allow him to retreat and respect his space. The best way to prevent dog bites is to educate both dog owners and anyone who interacts with dogs in the proper way to approach animals and interact with them in a non-aggressive, appropriate way. In Part I of “How to Prevent Dog Bites,” we talk about how to prevent dog bites by understanding dogs’ body language and dog owners’ responsibility in preventing bites. Properly socializing your dog at an early age will minimize the chances that he bites anyone. Linda Wagner’s article on puppy socialization can help.